The trip to the sea will be great if you no longer enjoy the noisy and stuffy Bangkok. If don’t have time to visit well-known places such as Phuket, Ko Samui, you can choose beaches near Bangkok. Buses and high-speed trains provide easy access tothese locations. Here are some of the best beaches near Bangkok that have stunning landscapes. About 3-hour drive from Bangkok, Hua Hin will bring you an unforgettable enjoyment. 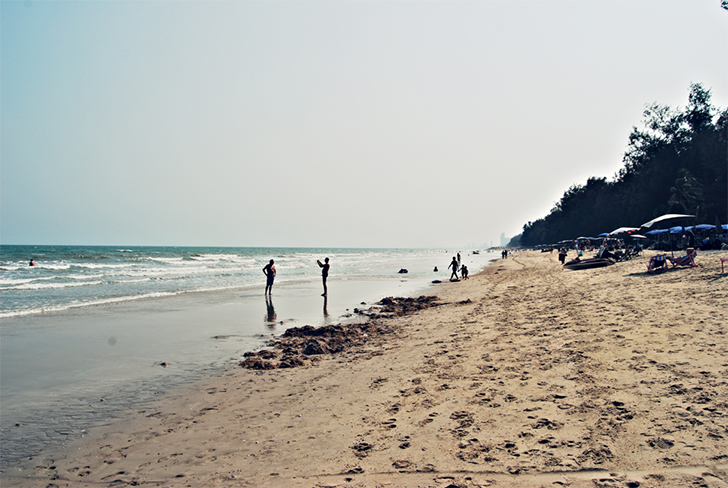 Hua Hin is one of the best beaches near Bangkok. This is a popular beach resort, located about 200 km from Bangkok. Once home to the Royal Thai Government, Hua Hin is known for being a well-off town, with many green parks, historic sites, the white sands, and luxury hotels. This is where locals often come at the weekend. Hua Hin has long white sand beaches with magnificent boulders in the sea. The grounds of some of the major hotels like Centara Grand Resort and Villas and the Hilton are right on the beach, which only takes few minutes walking to the sea. Hua Hin is quite interesting with the horses on the beach. You can ride a horse or pay a small fee for a horseback ride. Wandering around the bustling night market, the restaurants and bars are popular activities. In the daytime, this is an attractive place to catch freshlobsters, mussels, and fishes. Hua Hin offers a variety of accommodation options ranging from 5-star hotels to budget-minded holiday homes, from modern to luxurious with the antique andrustic design. Besides, there are more options located far from the town for those who are looking for an interesting nightlife; privacy or a romantic getaway. Hua Hin is a popular destination for both international and local travelers so you can also find many souvenirs. HuaHin has two night markets, a local market, and countless boutiques with local handicrafts such as clothes, and Thai goods, especially the natural cotton fabrics also called “Kommapat”, handmade dolls, andhandcrafted ornaments made of shells and coconuts. There are also local fruitslike pineapple, coconut, dried fruits, and aloe. Located quite far from Bangkok, but if you want to stay at the top beach in Thailand, consider going to Koh Samet. Although the travel problem is quite complex, the beauty of the island will satisfy even the most picky travellers. Koh Samet is a beautiful small island, located about 200km to the southeast of Bangkok, where some famous beaches like Hat Sai Kaew and Ao Thian are located. Koh Samet is a small island off the coast of Rayong province, then you need to travel here by boat which takes about 20 minutes. The island is quite diverse in terms of population living with Thai people and tourists from many countries around the world. Especially on weekends and festivals, this place is even much more bustling. From Monday to Friday, the island mainly welcomes the backpacking tourists. Thai people often choose hotels and resorts located near the harbor and beach for relaxation. So if you go a little further, you will avoid the noisy space to immerse yourself in the peaceful nature here. 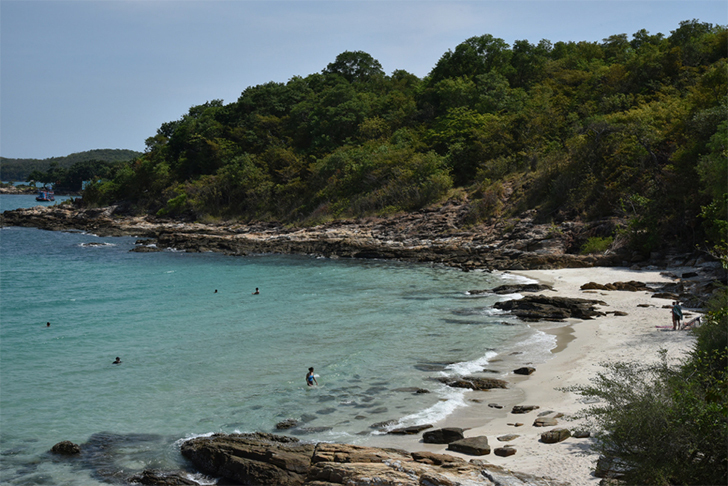 Unlike other bigger beaches in the South, Koh Samet is not affected by the typhoon during the rainy season. 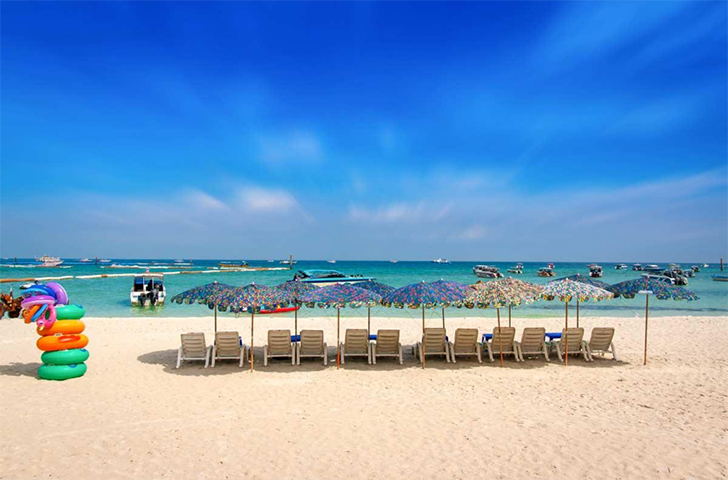 If you like the quiet and relaxing atmosphere, Koh Samet is definitely a great choice. Pattaya is about 165 km to the southeast of Bangkok, just over 15 minutes by speedboat. 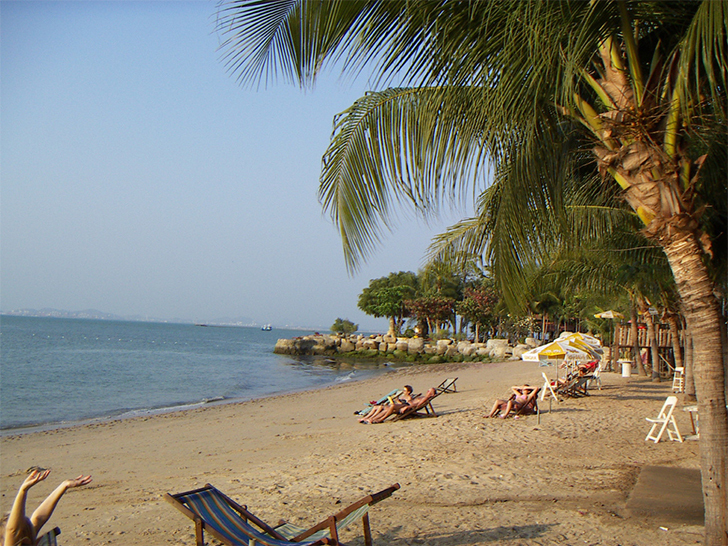 Situated in the heart of the city, Pattaya Beach attracts 8 million tourists each year. The island is well-known as a “city without sleeping” for the rhythm of life at night. It is only a small coastal fishing village but thanks to the economic and tourism development, Pattaya has become the leading tourist destination of Thailand. Pattaya is famous for its long sandy beaches, hawkish nights in the pedestrian street, and a unique culinary scene with delicious sour seafood. Coming to Pattaya Beach, visitors not only get into the world of nature but also participate in exciting games, making the trip to Thailand in the hot summer becomes worthy than ever. If swimming and hiking are the most interesting in the main beach area, thenorthern part of Pattaya Beach will give you the opportunity to take part in exciting games such as roller coasters, windsurfing, skydiving, boating,… or simply sitting somewhere to go fishing. 30 km to the South of Hua Hin, Pranburi is a growing tourist destination which has a long stretch of beach and is quietly nestled in the national park. Pranburi is one of the best beaches near Bangkok. Although Pranburi is a secluded place and may not have full of amenities like other beaches, in return, you will not regret to admire the beautiful scenery here. Thai families regularly visit this place for enjoying the fun weekend and admire the rare beauty on this beach. 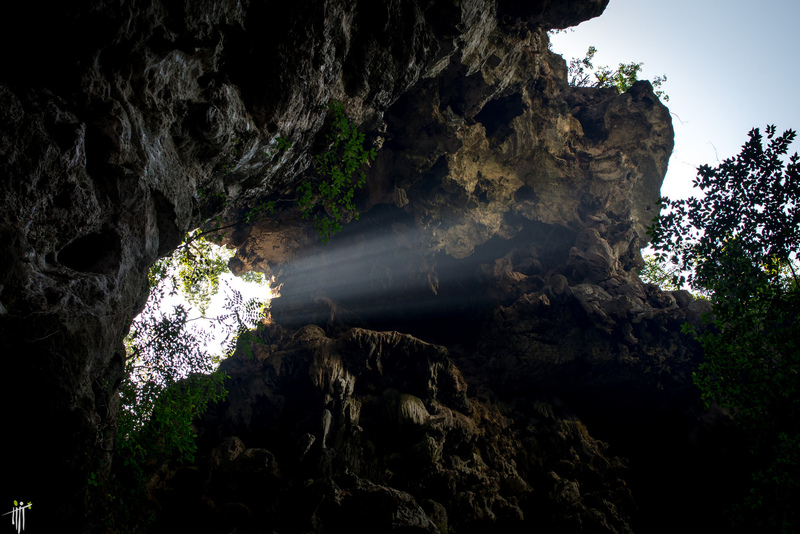 Besides, you may want to visit the famous Sam Roi Yot National Park after spending time on the beach. However, you will need to consider the suitable time when renting a taxi for the right dining option in the evening. Cha-Am beach is located about 150km to the South of Bangkok. This place is popular destination for local people but still lacking the attention from tourists. Cha-am has become an ideal place for those who are bored with the noise, dancing all night, and want to find a place to live peacefully. The beach is not as beautiful as Hua Hin, but has more infrastructures and resorts with a full range of facilities with unique architecture. Santorini Complex Park is the only modern and yet entertainment complex in Cha-am which has just been launched in early 2013, with a blue color inspired by the beautiful island of Santorini in Greece. Bang Saen is a very close to Bangkok, from the city centre you can easily drive to the beach and return just in the day. You can save money by not renting any accommodation in the coast. Not only for tourists, Bang Saen is also a popular stop for local people. On the beach, many bars and parlors are extremely cool. You can sit down and choose to buy some seafood to enjoy. The last position in the list of best beaches near Bangkok we want to suggest is Jomtien Beach. 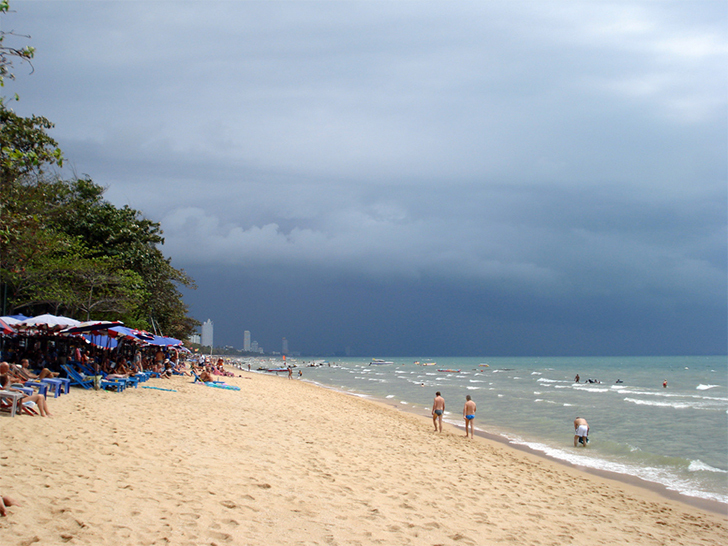 Jomtien Beach is located directly on the hill from South Pattaya. 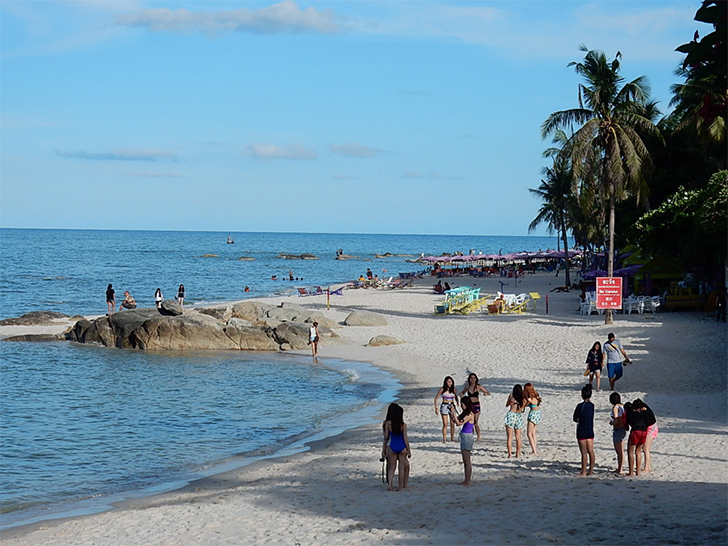 Comparing to the capital, it is also close to the capital Bangkok, especially this beach is an ideal stop for Thai tourists with families and children. If you want to enjoy the beach, watch the sunset and stroll along the coastline, you can rent accommodation right by the sea. Many hotels are located just across the road from Jomtien Beach. You can enjoy the comfort at an affordable price. Hope the information we provided above will be helpful for your trip to Thailand! Share and comment your experience below!